This Tele-Tubbie wannabe is now our secretary of state. Secretary of State John Kerry, who made his political bones calling American soldiers bloodthirsty barbarians and then ran for president as a war hero, having won three Purple Hearts without spending as much as fifteen minutes in the infirmary, recently told graduating students at Northeastern University to prepare themselves to live in “a borderless world” ( http://www.catholic.org/news/politics/story.php?id=68831 ). Let’s see, now… no borders… that means no countries, right? And if there are no countries anymore, well, that would imply a world government–one great big universal country. Are these globalist morons capable of rational thought? So, if you can’t do a certain job, but then you make it ten, twenty, or a hundred times bigger than it is already, does that mean you will then be able to do it? Can men like Kerry, or men like anyone else for that matter, even govern a single city wisely, efficiently, economically, and justly? Well, what city would that be, then? Detroit? New York? London? Camden? Tokyo? They’ve just begun to peel the lid off the current government of New York City, and the stink of corruption is already rising to high heaven. So, no, they don’t know how to govern a city. How about a state, then? Well, look at the job they’re doing on California. And when now-Governor Chris Christie was a federal prosecutor in New Jersey, he packed off to jail at least a hundred of our state and city officials, all on charges of corruption. So they can’t manage a state, either. How about a country? Are they any good at governing a country? If you can answer “yes” to that, there’s something wrong with you. Dissolving national borders and trying to govern the whole flaming world as one big country–does anyone in his right mind think that will ever work? I mean, look at some of these countries! If you think the U.S.A. or the United Kingdom, among the world’s least awful countries, are governed badly, take a gander at Mexico, Liberia, or Syria. The dynamics of history never change. There’s always some overly powerful and aggressive psycho who thinks he ought to rule the whole shebang. The only difference nowadays is that instead of a single kook, like Hitler or Napoleon or Alexander the Great, we’ve got a whole gaggle of globalist kooks, like Kerry, who think they and their friends are fit to do the job. The kingship of the earth is reserved for Jesus Christ, and no other. Consider the prophetic quality of this bit from Fawlty Towers, filmed back around 1970. Basil Fawlty (John Cleese), having abused, neglected, and insulted his hotel guests past the point of no return, spins around and blames them for everything. He is especially angry with the American guest who called him out for his incredibly shoddy and incompetent service. Kind of like Donald Trump has called out the Republican establishment. If they had a hotel, it would be Fawlty Towers. Ooh! Decades later, Trump and angry voters are blamed for the prat falls of the GOP–and they’re calling his supporters “Nazis” because they raised their hands, and Trump is “Hitler” and “Mussolini,” and so on. I haven’t seen such irrational hatred of a candidate, and heard such pure venomous twaddle spouted about him, since poor Barry Goldwater in 1964 was accused to wanting to blow up the world. The Democrats actually ran a TV ad claiming that mushroom clouds would spring up all over the world if Goldwater were elected. If these bums are so afraid of Trump, there must be something good about him. In the hall of Charn’s dead kings and queens, Queen Jadis returns to life. But she hasn’t learned her lesson. For me, one of the most memorable scenes in C.S. 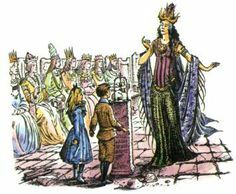 Lewis’ Chronicles of Narnia occurs in The Magician’s Nephew when Digory and Polly travel to a world called Charn and find it completely dead. No blade of grass, no drop of water–all dead, all dust. In the dead city of Charn they find a hall of perfectly preserved dead kings and queens of Charn. How did this happen? This was written in the 1950s, when fear of a world-destroying nuclear war was a new thing, and very real to many people. World War II was also fresh in memory. Can there be any doubt that Hitler, cornered in his bunker, would have spoken The Deplorable Word, if he’d had it? When the Serpent seduced Eve with his “ye shall be as gods” snake-oil, he tapped into a fatal aspect of human nature that remains with us today–the desire to be, like God, supreme ruler over everything. But God has promised that honor to His Son, Jesus Christ; and instead of a Deplorable Word, God says, “Behold, I make all things new” (Revelation 21:5)–thus highlighting the difference between a righteous, loving God and sinful, fallen man. The lust to rule the world is still with us, in spades–in the U.N., in Washington, D.C., in Brussels, in ISIS, among the Global Warming mob, and liberally strewn throughout the minds of intellectuals. But God is with us, too, and His word shall prevail.